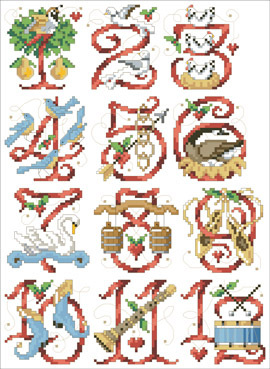 Twelve Days of Christmas - Cross Stitch PDF Download The Twelve Days of Christmas are ready to count down. You may want to stitch these 12 images as ornaments, and as a sampler. They are a really lovely addition to your holiday décor. Contents: Ornaments are 35 stitches wide by 35 stitches high. If stitched on 14 count they would measure 2.5" wide by 2.5" high.